It’s fall and there is nothing better than a big bowl of homemade crunchy granola and a cozy blanket with fuzzy socks on. Yep, that’s how we roll in the fall weather. 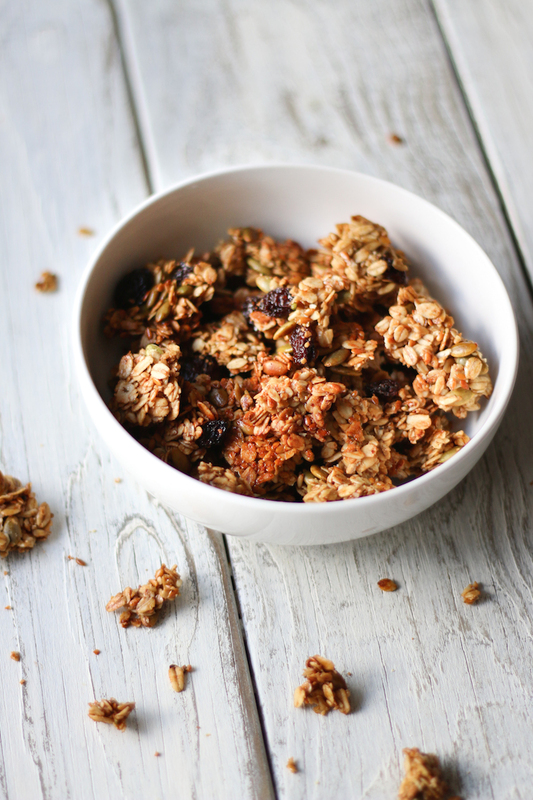 So I thought I’d share a healthy fall flavored pumpkin spice granola clusters recipe. It’s the perfect recipe for those homemade gift ideas! I wasn’t always a fan of making granola at home, but since we don’t really buy boxed cereals at the grocery store, I’d thought I’d give it a try. Now my kids are hooked and they have been asking for some every week. The truth is that I wouldn’t really have a problem with cereal but most cereals sold are just candy coated, junk food and that’s not how you want to start your day. Homemade is always better since you can control what goes in it. 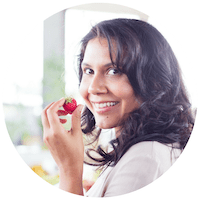 That means, no refine sugars, processed oils, unwanted chemically laced ingredients and you can add all the super foods you want. This super crunchy granola cluster recipe has flaxseeds, shredded coconut, pumpkin seeds, coconut oil and of course pumpkin puree. Its lightly sweetened with coconut sugar but you can substitute that with maple syrup if you like. 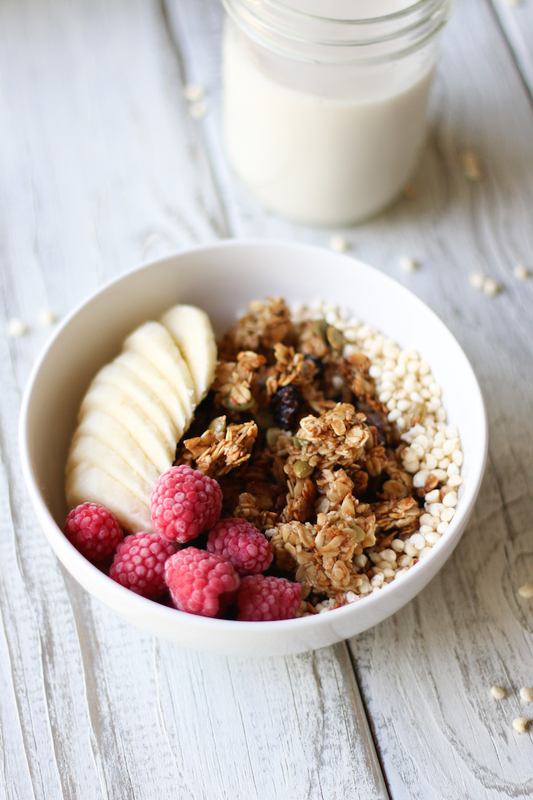 Treat yourself to this delicious homemade granola cereal. 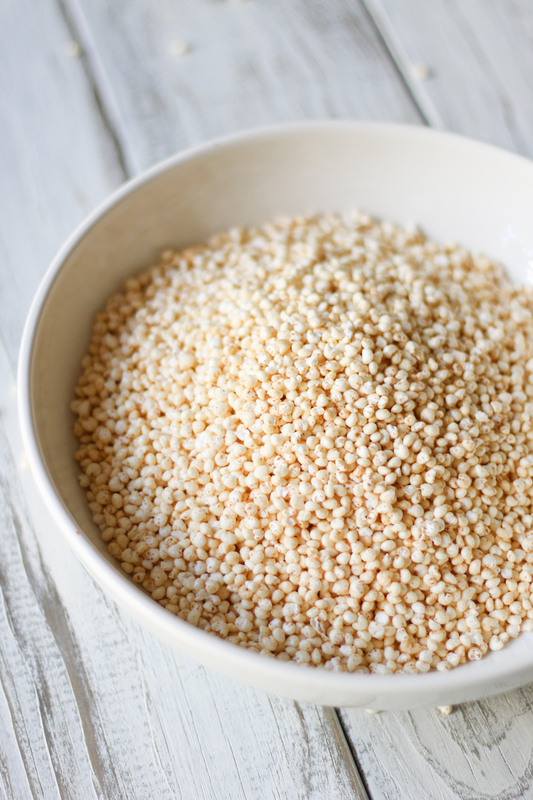 Have it in a bowl with milk or use it as a topping with my classic chia pudding recipe. When making cereal I like to mix it with popped mullet and fresh fruit. 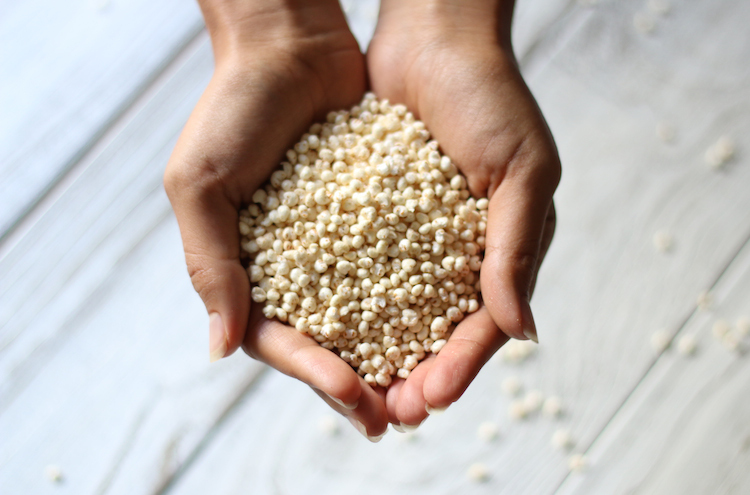 1 bowl, 30 minutes, A healthy breakfast alternative that's vegan and gluten free. Preheat the oven to 325 degrees F. Line 2 baking sheets with parchment paper or silicone mats; set aside. 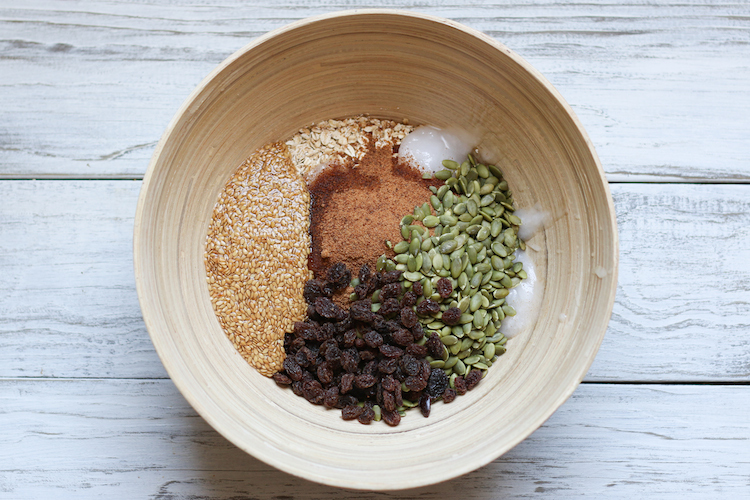 In a large bowl, combine oats, pumpkin seeds, raisins, coconut flakes, flax eggs, pumpkin puree, coconut nectar, coconut sugar, coconut oil, cinnamon, pumpkin pie spice, ginger, vanilla, and sea salt. Toss to combine. 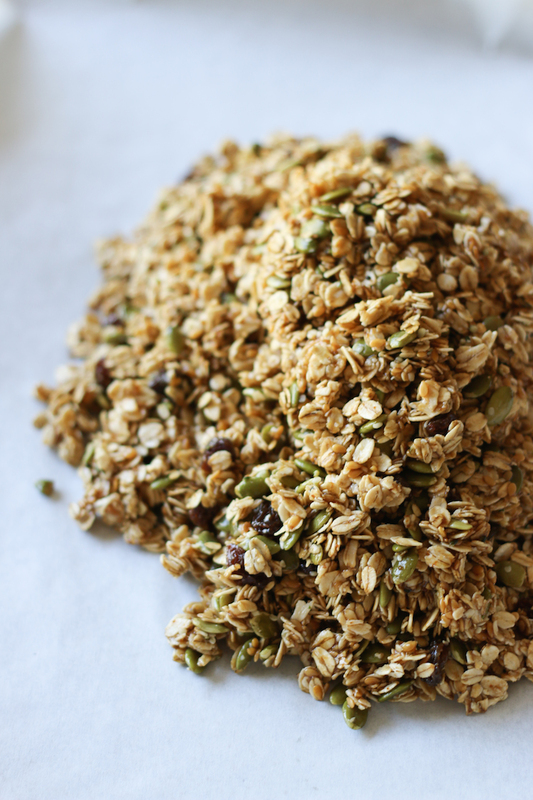 Evenly distribute the granola mixture onto your baking sheet. 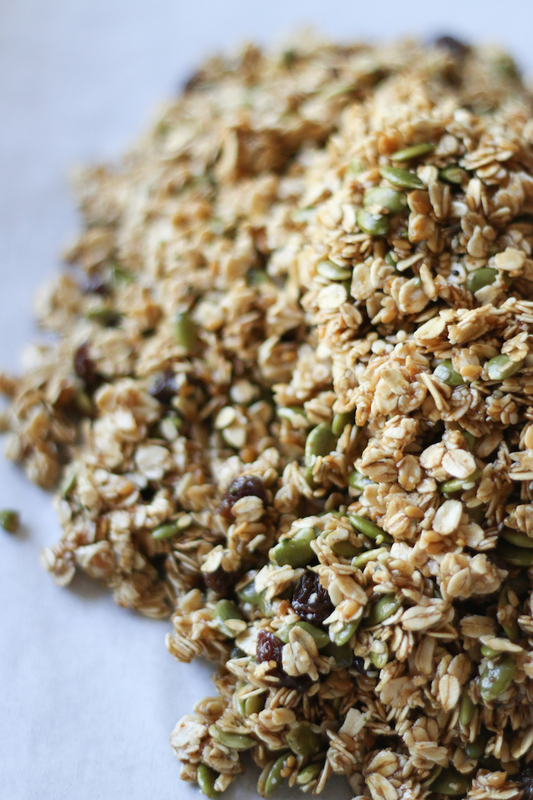 To get the big clusters, firmly press granola onto your baking sheet. This will help it to stick together, allowing you to break it up into the cluster size after baking. 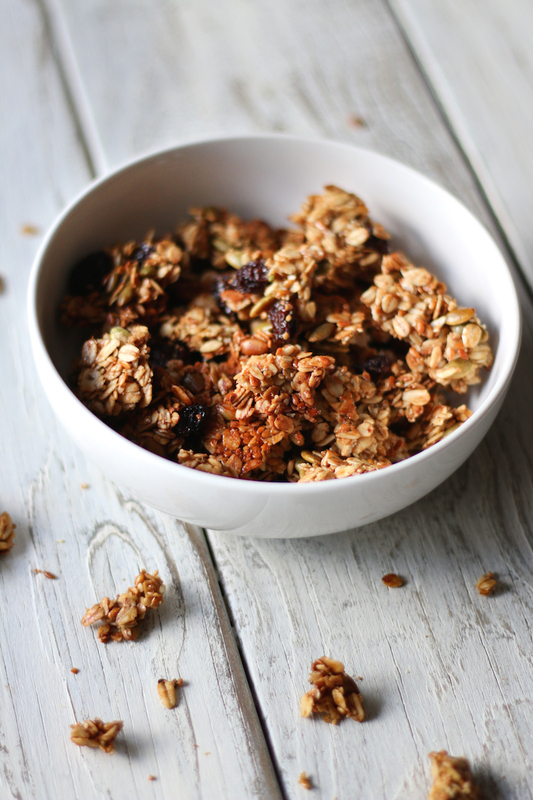 Bake the granola for 25- 30 minutes or until golden brown. Allow the granola to cool for at least 20 minutes. The granola will get crunchy once it’s cooled. Cover tightly and store at room temperature for up to 1 week. Granola will lose it’s crunch over time because of pumpkin. Spread in a single layer on a baking sheet and bake at 325 degrees F for 10 minutes to refresh. Allow to cool before enjoying. I hope you make this pumpkin spice granola recipe, it’s all the fall flavors in one bowl. If you do make it be sure to tag me on Instagram @LiveSimplyNatural or you can always pin it on Pinterest for later. I love seeing what you guys are cooking up in your kitchens. Stay tuned for more healthy plant-based recipes.